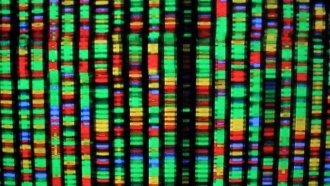 Is The Machine That Can Snip And Swap Our DNA Awesome Or Ominous? CRISPR scans our genes to find the ones that might trigger certain diseases. CRISPR is not science fiction. It's real. Even cool-headed, methodical scientists call it miraculous. CRISPR stands for "Clustered Regularly Interspaced Short Palindromic Repeats." Usually when you hear CRISPR, people are talking about CRISPR-Cas9, technically, which hit the scene in 2012 — a mix of enzymes and genetic guides that combine to search and change DNA. Basically, Ctl+X. And then Ctl+V. The gene editing tool can change DNA down to the letter. DNA determines your physical characteristics — say the color of your hair, the shape of your face and even whether you are likely to develop certain diseases. CRISPR can insert sequences that change inherited traits or just delete them altogether. Thus far, CRISPR has been mostly used in labs for studies, but the promise in the real world is great. Related Story Do You Know How Private Your DNA Data Is? Pre-designed RNA, which functions as a messenger within an organism's genetic makeup, finds the targeted spot in the DNA and binds to it. An enzyme follows the RNA to that spot and acts as a pair of "molecular scissors," snipping the DNA. At this point, scientists can change the DNA by inserting new material or deleting unwanted material. Once the ideal DNA is ready, the treatment involves transfusing the edited cells back into the body. Researchers have already used CRISPR to fix genetic diseases in animals, to combat viruses and to sterilize mosquitoes. They've also used it to prepare pig organs for human transplants and to beef up the muscles of beagles. Scientists in China report using the science to engineer the cells of at least 86 cancer and HIV patients, and apparently, some have improved. But more study is needed. Some big ethical questions exist, especially as the science evolves. Most of the changes made so far have not involved egg and sperm cells. These changes would not be passed from one generation to the next. However, changes made to an egg or sperm cell could be passed to future generations. This raises the question of whether it's okay to use CRISPR to alter human traits, maybe height or intelligence. Even Down Syndrome. A new medical frontier is here. CRISPR is ready to cut and paste. But who will decide what's constructive, and what's cosmetic?